FALCON VS Digital FM-Audio Processor 5-Band, MPX stereo generator, Stereo Enhancer, Brilliance control, Limiter LookAhead, Expander, Overdrive. Audio changeover, I/O Analog, Digital, MPX, double MPX Outs. MPX Split. GPIn and GPOut USB-Serial. Remote control Software, interface for Radio Automation and GPS. Bij aanschaf van dit product krijgt u in totaal 119 Loyaliteit punten. Uw winkelwagen bevat een totaal aan 119 Loyaliteit punten die omgezet kunnen worden in een waardebon van € 23,80. 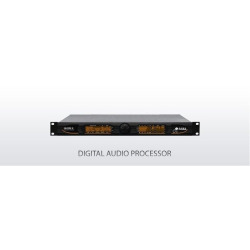 Plus Digital RDS/RBDS encoder option for Falcon VS.
FALCON VS is the high performing digital audio processor combining also the Stereo Generator and the RDS Encoder. It is the all-in-one solution designed for FM broadcasting, WebRadio and Satellite stations. FALCON VS provides a great outstanding sound, thanks to the powerful DPSs, 5-band architecture, the dual band AGCs, 3-band equalizer, stereo enhancer, speech detector and 4 limiters. The control of each audio parameter allows the broadcaster to design its favorite audio preset to get a unique branded sound. The optional LAN port with the built-in Web Server allow to take the control of the processor and tune the audio from anywhere. FALCON VS features a full connection/connectivity with analogue and digital I/O (over XLR connectors) and 2 independent MPX outputs, USB, GPI and serial ports. The hardware bypass circuit is always included to guarantee the presence of audio and continuity of audio programs.